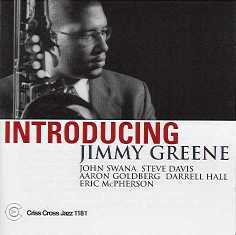 It's always a joy to introduce a promising new artist to the jazz world, especially one as mature and self-assured as tenor saxophonist Jimmy Greene. Assisting Jimmy as he offers this program of orginal compositions and standards are two top artists from the Criss Cross Jazz roster, trumpeter John Swana and trombonist Steve Davis. The rhythm section has pianist Aaron Goldberg, bassist Darrell Hall and drummer Eric McPherson. An ex-student of Jackie McLean, Jimmy plays with the Harry Connick Big Band and is a member of the new Horace Silver Quintet now.